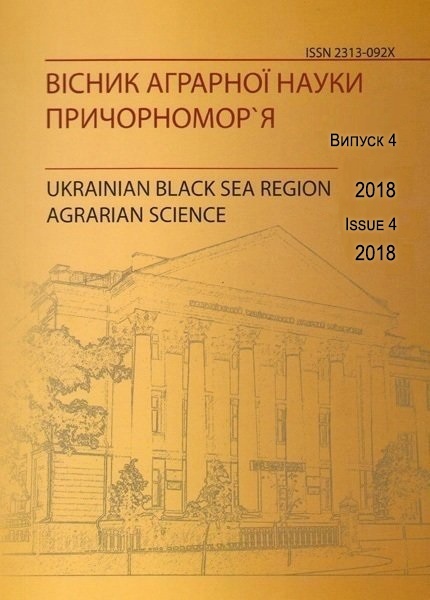 Editorial board of the “Ukrainian Black Sea Region Agrarian Science” Journal, publishing by Mykolayiv National Agrarian University, maintains a certain level of requirements when selecting and accepting the articles submitted to the editorial board of the journal. The standards are determined by scientific directions of the journal which are fixed in the Certificate of State Registration and in the quality standards of scientific works and their exposition accepted by scientific society. 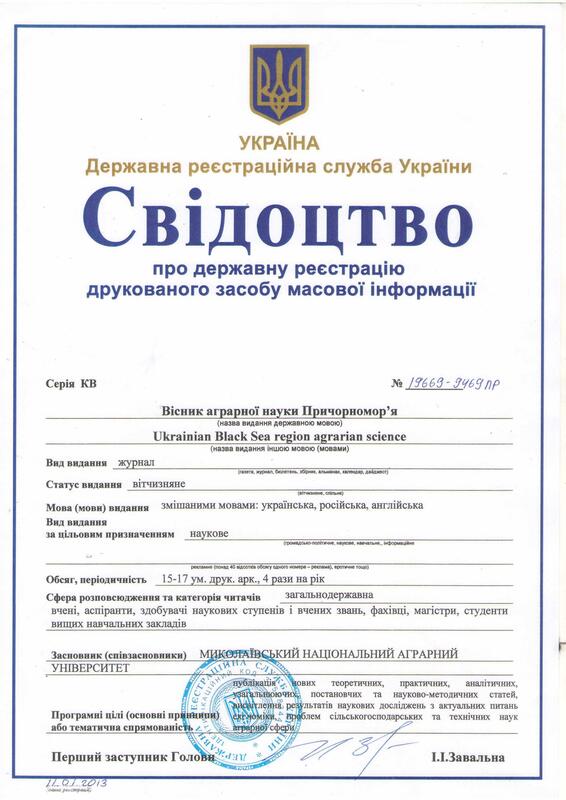 When developing the regulations of publishing policy of the Journal “, the editorial board followed the recommendations of Committee on Publication Ethics (COPE) and the experience of foreign and Ukrainian communities, scientific organizations and publishing editorial boards. The dominant feature of professional scientific community is acceptance by scientists and specialists the Code which fixes the fundamental norms of behavior and duties of the members of community to each other and to the public opinion. The Code is determined by the desire for providing the maximal advantage for professional community and to limit the activities serving for egoistical interests of individuals, to provide each author’s intellectual property right. 1. Main duty of an author is to present an accurate account of the research performed as well as an objective discussion of its significance. 2. Whole responsibility for content of articles and for the fact of publication rests with author(s). Editors do not bear responsibility for probable damage caused by publication of a manuscript to authors or third parties. Editors have the right to withdraw the article already published in case somebody’s rights or generally accepted norms appear violated. Editors inform author(s) of the article, persons who gave recommendations and representatives of organization, where the research was held, about the fact of withdrawal. 3. An author should be aware that journal space is a limited resource and should use it wisely and economically. 4. A primary research report should contain sufficient detail and reference to public sources of information to permit the author’s peers to repeat the work. 5. An author should cite those publications that have been influential in determining the nature of the reported work and that will guide the reader quickly to the earlier work that is essential for understanding the present investigation. Except in a review, citation of work that will not be referred to in the reported research should be minimized. An author is obligated to perform a literature search to find, and then cite, the original publications that describe closely related work. For critical materials used in the work, proper citation to sources should also be made when these were supplied by a non author. 6. Any unusual hazards appearing during an investigation should be clearly identified in a manuscript reporting the work. 7. Fragmentation of research reports should be avoided. A scientist who has done extensive work on a system or group of related systems should organize publication so that each report gives a well-rounded account of a particular aspect of the general study. 8. In submitting a manuscript for publication, an author should inform the editor of related manuscripts that the author has under editorial consideration or in press. Copies of those manuscripts should be supplied to the editor, and the relationships of such manuscripts to the one submitted should be indicated. 9. It is improper for an author to submit manuscripts describing essentially the same research to more than one journal of primary publication, unless it is a resubmission of a manuscript rejected for or withdrawn from publication. It is generally permissible to submit a manuscript for a full paper expanding on a previously published brief preliminary account (a “communication” or “letter”) of the same work. However, at the time of submission, the editor should be made aware of the earlier communication, and the preliminary communication should be cited in the manuscript. 10. An author should identify the source of all information quoted or offered, except that which is common knowledge. Information obtained privately, as in conversation, correspondence, or discussion with third parties, should not be used or reported in the author’s work without explicit permission from the investigator with whom the information originated. Information obtained in the course of confidential services, such as refereeing manuscripts or grant applications, should be treated similarly. 11. An experimental or theoretical study may sometimes justify criticism, even severe criticism, of the work of another scientist. When appropriate, such criticism may be offered in published papers. However, in no case is personal criticism considered to be appropriate. 12. The co-authors of a paper should be all those persons who have made significant scientific contributions to the work reported and who share responsibility and accountability for the results. Other contributions should be indicated in a footnote or an “Acknowledgments” section. An administrative relationship to the investigation does not of itself qualify a person for co-authorship (but occasionally it may be appropriate to acknowledge major administrative assistance). Deceased persons who meet the criterion for inclusion as co-authors should be so included, with a footnote reporting date of death. No fictitious name should be listed as an author or coauthor. The author who submits a manuscript for publication accepts the responsibility of having included as co-authors all persons appropriate and none inappropriate. The submitting author should have sent each living co-author a draft copy of the manuscript and have obtained the co-author’s assent to co-authorship of it. 13. The authors should reveal to the editor and to the readers of the journal any potential and/or relevant competing financial or other interest that might be affected by publication of the results contained in the authors’ manuscript. All authors should not have any personal significant financial interest and employment or other relationship with entities that have a financial or other interest which can affect the results described by the manuscript.